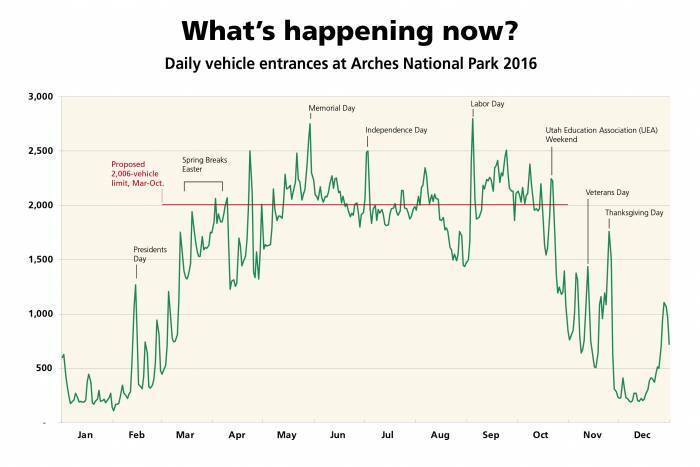 Big changes might be coming to Arches National Park. A recently proposed Traffic Congestion Management Plan aims to limit the number of vehicles entering during peak times. The proposed plan allows only vehicles with an entry reservation into the park between 7 a.m. and 6 p.m. during the high-visitation season, March through October. A total of 2,006 reservations per day will be available online up to six months in advance. 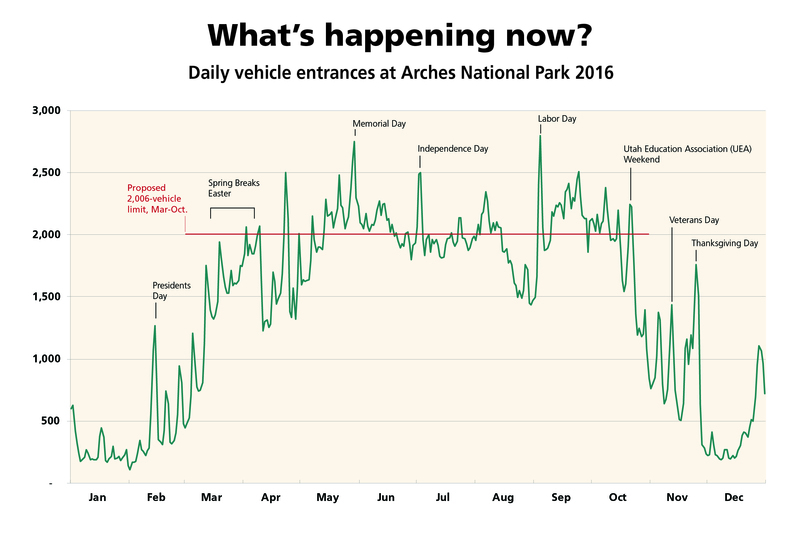 In 2016, visitors to Arches National Park exceeded 1.6 million. The median daily vehicle entrances between March and October totaled 1,950. We visited the park June 9–14 this year. There were big crowds (see above), full parking lots, and an insanely long line to enter the park. At a nighttime ranger program, the ranger spoke confidently about the implementation of a vehicle entry reservation system in spring 2019. We dug into the details of the plan to find out what next year’s visitors need to know if the park approves the plan this fall. From 2006 to 2016, Arches’ visitation increased by 90 percent. 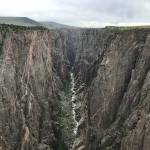 This rapid growth — combined with the park’s relatively small size, a single entrance, and the widespread popularity of its iconic features — quickly began to negatively affect the visitor experience. Long entrance lines, full parking lots, and bustling trails soon became the norm. And that’s a bad combo when coupled with 100-plus-degree temperatures common in the area. In 2011, the park initiated an Alternative Transportation System and Congestion Management study. 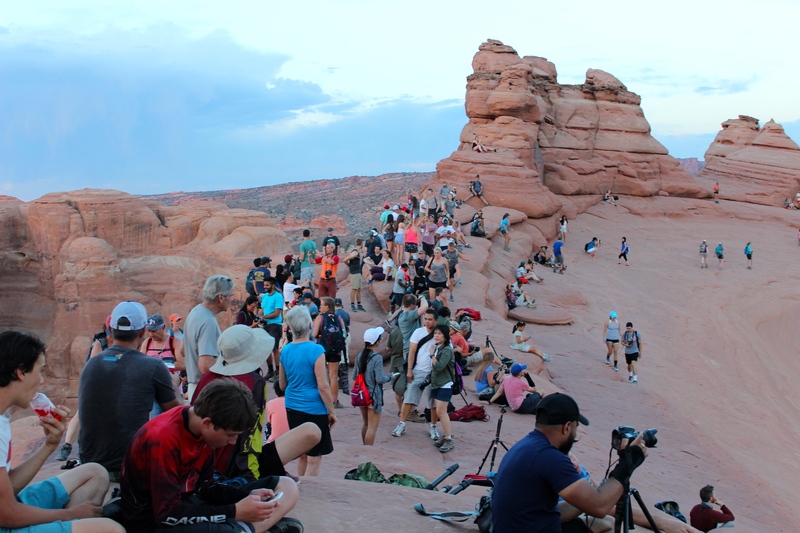 The park sought to reduce traffic congestion, air and noise pollution, greenhouse gas emissions, and the impacts of transportation on Arches’ resources. Ultimately, the study included both shuttle and non-shuttle alternatives for the park. Officials quickly dismissed the shuttle alternative due to the length of the road system (52 miles) and maintenance costs. Other alternatives, like a “one-in-one-out” system and a second park entrance, were also nixed. 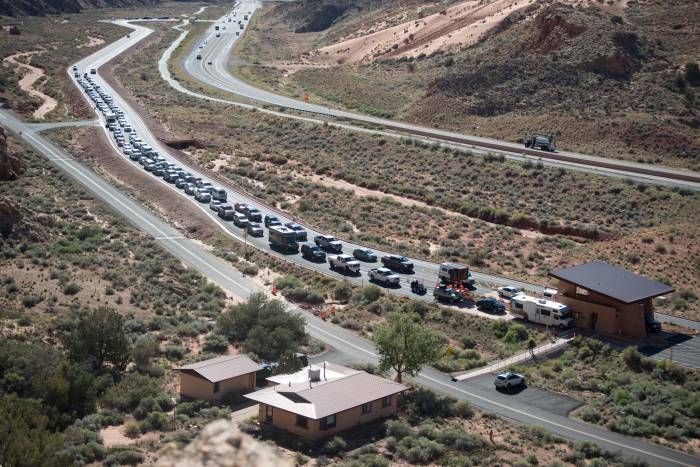 Since that study, Arches National Park researched other congestion management solutions. It finally proposed the most recent Traffic Congestion Management Plan (TCMP) on November 1, 2017. The 46-page plan (available here) describes and compares two alternatives for alleviating traffic congestion in the park: (1) no action and (2) a vehicle entry reservation system. After the plan was released, an open comment period was held from Nov. 1, 2017, to Dec. 18, 2017. People across the globe, including 46 attendees at a public meeting in Moab, submitted 421 comments. Arches is now evaluating the feedback and considering it for a final plan, due this fall. 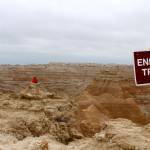 Park officials can’t say with certainty whether or not there will be a reservation system. They also don’t know what the system would consist of. We will update this article if the system is finalized. That said, the currently proposed system is described below. Timing: The plan will tentatively launch in spring 2019 — no earlier than March 2019. 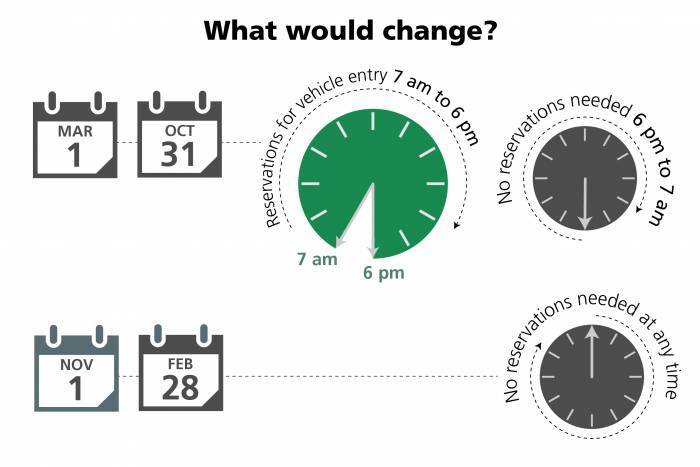 Details: The reservation system would effectively spread out vehicle entries by requiring visitors to reserve entry times in advance. Reservations will only be required for visits from March through October. The amount of vehicle reservations available each day is 2,006. However, even during those months, visitors may enter the park without a reserved entry time from 6 p.m. to 7 a.m. Seven days a week, four reservation time slots will be available: early morning (7–9 a.m.), late morning (9 a.m.–noon), early afternoon (noon–3 p.m.), and late afternoon (3–6 p.m.). How and when to make a reservation: The reservation system would be internet-based, likely on Recreation.gov. Advanced reservations may be made more than one day and up to six months before arrival. If you don’t have an advance reservation when you arrive, 25 percent of the total supply will be available on a day-before/day-of basis. Visitors can reserve a day-before or day-of entry time online or by phone. What your vehicle entry reservation means: You may enter the park anytime within your selected reservation time slot and stay in the park for as long as you’d like once you’ve entered. If you have reservations for the Devils Garden Campground or a Fiery Furnace Tour, you may enter the park at any time and don’t need to make a separate entrance reservation. Additionally, if you’re arriving at the park in a commercial guide vehicle, you don’t need a reservation. Other reservation exceptions include visitors on foot or bicycle, visitors with a Special Use Permit, visitors from 6 p.m. to 7 a.m., and visitors from November through February. Visitors meeting guides in the park must have their own advanced vehicle reservation. Updates: The Arches National Park webpage is the best way to stay updated on the plan’s progress. Potential downsides are that visitors without reservations might have to make other plans, like returning on another day. Additionally, with 75 percent of the reservations available up to six months in advance, ideal entry days and time slots could be full by the time you finalize your plans and are ready to reserve. 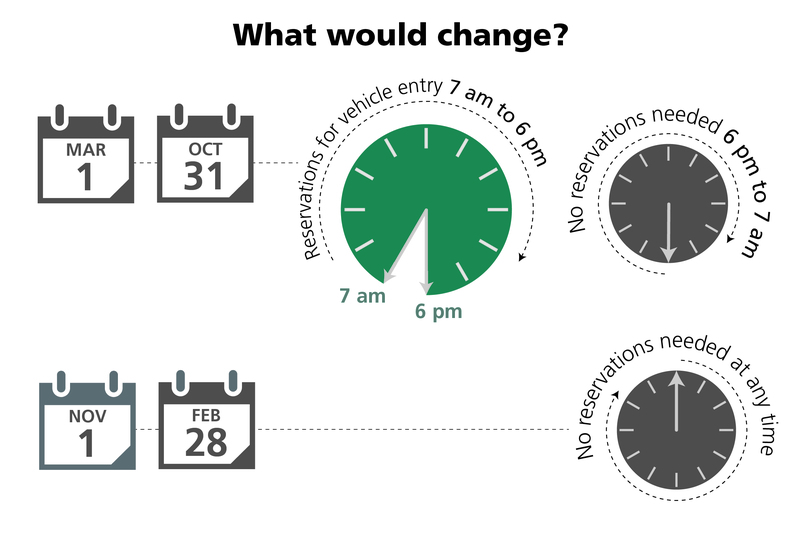 If that becomes the case, remember the workarounds: Enter the park between 6 p.m. and 7 a.m. (no reservation required), or try for a day-before/day-of reservation online — the system would save 25 percent of reservations for this purpose. We will stay on the lookout for updates and the announcement of the final plan this fall. We’ll revise this article accordingly and repost it with the news and any other critical information. You can also visit the Arches National Park page for additional updates. Park officials assured the public there will be ample time between the final plan’s release and its implementation to prepare everyone for the new system.